Please refer to our stock # ILLC3 when inquiring. 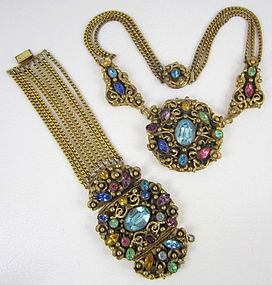 This amazing vintage Czech set has a necklace measuring 16 1/2" long with a 6" x 2" center element and the matching bracelet is 7" long x 2" wide. It is made from gold tone filigree brass and is intricately set with pastel faceted crystals. It has no markings and it is in very good condition.